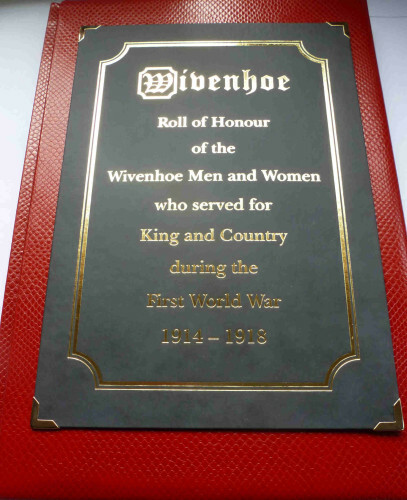 This is the story which led to the publication of Wivenhoe’s Roll of Honour in which the names of everyone from Wivenhoe who served in World War 1, or at least had been discovered by mid-2016. We don’t know how many names are missing as there is no single list that is available to go and look up all of the names of these people. People signed up to serve in the Army at different times, and many others of course enrolled in the Royal Navy, the Royal Naval Reserve, or in the Mercantile Marine. A few women also volunteered to serve in the VAD (Voluntary Aid Detachment run by the Red Cross in France). This Roll of Honour was apparently produced, framed and fixed to the outside wall of the then U.D.C. offices, at Little Wick in the High Street on the corner with Alma Street. It has since completely disappeared. This intrigued him. When applying for a grant from the Heritage Lottery Fund towards the History Group’s work in recording and promoting knowledge about Wivenhoe’s involvement in World War 1 to schools and via our community web site, Gill Strudwick included some money to produce this specially bound book of the Roll of Honour. 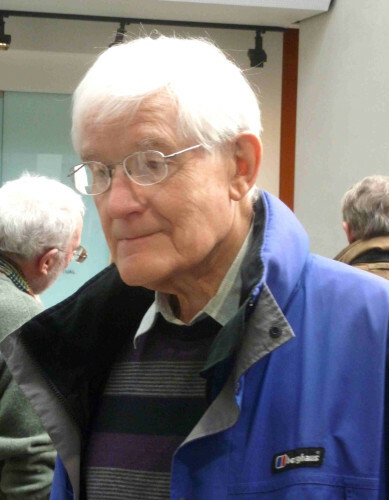 We are grateful to Vince Rayner who has donated his time for the typesetting of the book, whilst Gill has been project managing and working with Vince to get the book printed. The book contains the names of 313 men and women who served and includes the names of the 46 men who died and whose names are inscribed on the War Memorial. Indeed Ian’s research has uncovered the fact that 70 people lost their lives because of the War. We don’t know though the reason why so many names were omitted. Because of Ian’s researches, they are all recognised now in this Roll of Honour. There is a full list of names of all those people who served including the names of those who died here in the History Group’s archive – see here. We have created links from this list to individual pages giving information about each individual where we have that information. This was initially done for each of the names inscribed on the War Memorial and we are adding more information all of the time. If anyone knows more information about these people, or have pictures of them, please do get in touch. The Roll of Honour was presented at the Annual Service of Remembrance in St Mary’s Church Wivenhoe on Sunday 13th November 2016, where it was Blessed and Dedicated by the Rev Erwin Lammens, Rector of St Mary’s, in front of a large crowd attending the Service. Following the presentation, blessing and dedication of the Roll of Honour, it went to the British Legion Hall on The Quay where it will be housed in a special cabinet being made by Karl Douzier. 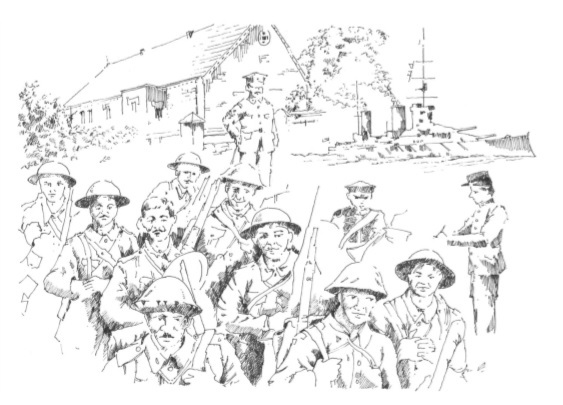 One of the sketches done by Frank Baker BA (Hons) which were first published in his booklet ‘The Fallen of Wivenhoe’ and later included in the Roll of Honour. Apart from the volume containing a list of names, and the regiment in which they served, or the arm of the Services, it also contains some sketches made by Frank Baker, a local artist. In addition to the main volume itself, Gill Strudwick has had a number of copies of it printed so that they can be placed in various locations as the Churches in Wivenhoe, the Library, the Town Council offices and the Chapel Museum. and especially to the Heritage Lottery Fund for funding the cost of printing the Roll of Honour. – and Ian Hook, Curator at the Essex Regiment Museum. Wivenhoe War Memorial, The National Archives, Essex Regiment Museum, the following newspapers: Essex Telegraph and Essex County Standard (1914 – 1918), Essex Record Office, ‘Wivenhoe’s Fallen’ by Frank Baker, ‘The Story of Wivenhoe’ by Nicholas Butler, The Church of St. Mary the Virgin, Wivenhoe, Wivenhoe Congregational Church, Wivenhoe Masonic Hall, Commonwealth War Graves Commission and Internet sites relating to World War One. This page was added on 13/11/2016.